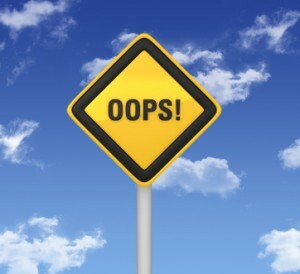 It’s 2013 and senders are still making common mistakes that are hindering the success of their email program. We understand that some of things aren’t that easy, but by not paying attention to them, you are actually creating more work for yourself. It’s time to turn over a new leaf. Here are the top mistakes senders make when sending email that you should stop doing starting today! Lack of personalization. Almost all email service providers give you the ability to at least add your user’s name to every email you send. Get to know your ESP and learn how to use even the most basic functionality. Personalization is key in building trust with your customers and will help separate your messages from batch and blast senders who are just looking to increase their numbers. If you don’t have access to this functionality, change providers. Spelling/grammar mistakes. Read, proof and re-read each email several times BEFORE you press the send button. It’s embarrassing and unprofessional to send an email ripe with errors. It shows a lack of preparation and detail that will not bode well for your brand. Always have another set of eyes review your messages. If that’s not an option, read your emails backwards and then out loud to yourself. That will help you catch mistakes. Purchasing emails. Customer acquisition is the goal for most companies, but some are still resorting to purchasing email addresses to grow their database. This is a slippery slope at best. It’s better to acquire users through your own channels. Acquiring users that have actively opted in to hear from you will ultimately provide more value. However, if you do decide to purchase from a third party, vet the source and develop an opt-in program to ensure these subscribers really want to be added to your list. Failure to remove inactives. Many senders refuse to remove unengaged subscribers from their list in hopes that they will eventually respond. If they haven’t responded in 60 days, either remove them from your list or put them into a reengagement program. Remember, many ISPs are using engagement metrics to help determine delivery so it’s in your best interest to only send to active subscribers. Lack of testing. Just because it’s not broken, doesn’t mean it’s working efficiently. Test different offers to see if you can improve your results. Any lift in your response can work in your favor. Put equal focus (if not more) into optimizing your user base as you do to new customer acquisition. You might find that this redirected energy produces better email ROI. Poor monitoring tools. Monitoring your email delivery on a daily basis is no longer optional. If email is important to the health of your business, you need to readily identify and prevent delivery failures. Without access to this information, you are dealing with unknown factors that are costing you revenue, time and resources. Shine a bright light on your email program and get the data you need to build a strong and healthy program that helps drive business value.